Have you ever wondered how Google traffic flows for certain industries? Here’s what I found and some insights on what’s happening in Google searches for insurance, real estate, tourism, medical schools, aviation, call center, job, and automotive industries. Since I couldn’t find anything specific for Philippines, I had to start from scratch. It’ll be a bit hard to start from scratch but, somehow, I felt like I had to get to people whatever data I’ll gather. I used Ahrefs.com and basically typed in Major Business Categories with the word Philippines suffixed to the industry. This gave me a list of a ton of keywords which I later sorted myself. I had over 40 keywords which I thought had pretty solid search volumes. I then transferred those keywords into Google Planner in Adwords. And the list of keywords, sorted by maximum clicks and not monthly searches for Googles Pay Per Click. 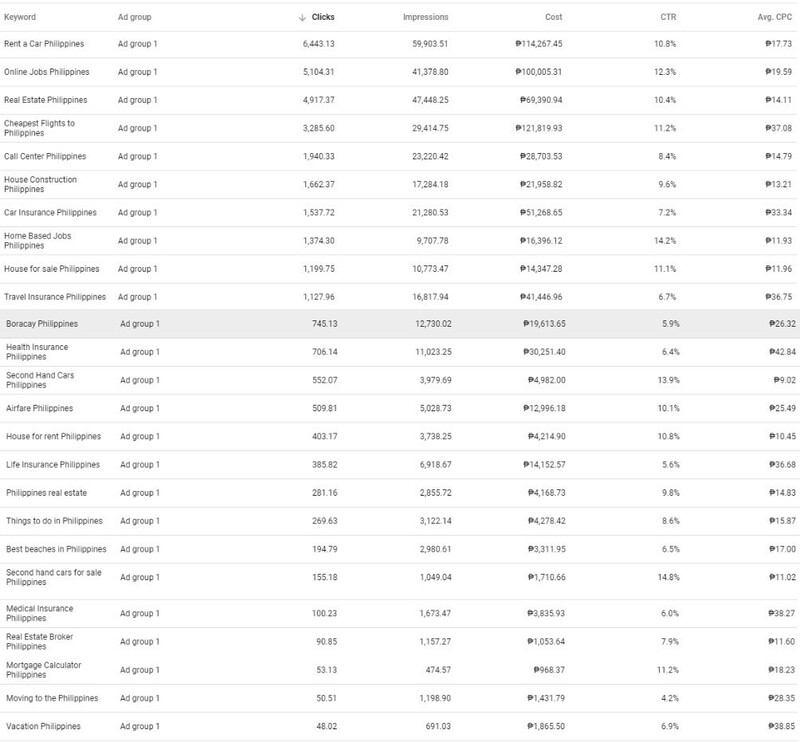 Here’s the most clicked paid keyword: Real Estate Philippines with almost 5,000 clicks, each click costing P14.32. Here’s the most expensive keyword: Health Insurance with P42.84. I omitted Medical School Philippines as the Clicks per month and the CTR were very low, although the CPC was higher than Health Insurance Philippines. Now, let’s look at the organic, non-paid part of Google and see what we can find. What this tells us is that there are some keywords that have a high search volume with low competition. So, if you are in those industries, you can have your SEO person try and rank your site organically for such keywords. 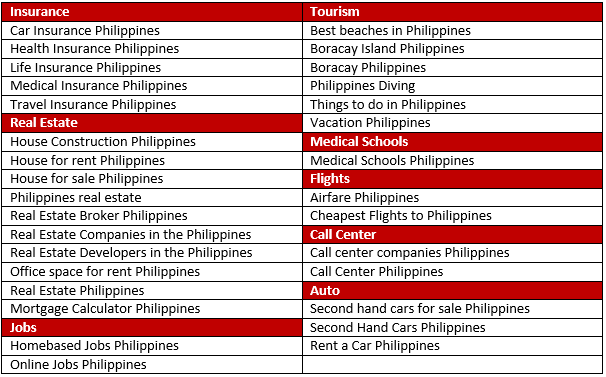 Construction keywords, Medical Schools, Tourism focused on Boracay keywords will work well for you instantly. Conclusion: These industries have a very high chance of doing well in Search Marketing using both Paid Ads and Organic SEO. I wrote a blog on the Purpose of SEO just in case, you want to know more about it and in case you want to know how to be an SEO master in the Philippines yourself. In this blog, I discussed the nine points why SEO is not just about ranking, but how it is also about branding, communications, and overall professionalism. Remember, if you want more information specific to your industry and business, you must work with a digital marketing marketing company that offers remarkable services in the Philippines. Thanks for the read and if you liked it, please share this article.